BANGI 7 August 2010,- UKM has succeeded to dispel earlier skepticism of its graduates when its medical and legal specialists are not only recognized for their ability and professionalism but are greatly sought after even by the developed countries. Speaking at the second session of UKM’s 38th Convocation this afternoon, Vice Chancellor Prof Tan Sri Sharifah Hapsah Syed Hassan Shahabuddin said alumni of its Medical Faculty have become renowned specialists in countries where they are serving while the faculty has become a place of choice for specialist training. A total of 775 graduands from the Medical and Law Faculties and the Institute of Molecular Medical Research receive their scrolls this afternoon. She congratulated Professor Dr. Micheal Kerin Morgan from Australian School of Advanced Medicine, Macquarie University who was awarded an Honorary Doctorate in the field of Neurosurgery. 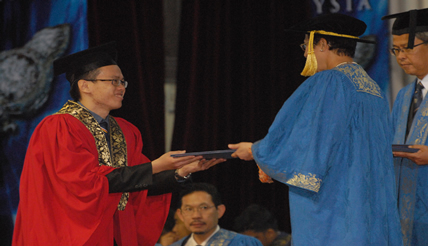 UKM Medical Faculty has to date produced 4626 doctors and 2677 specialist in various fields of medicine. The Medical Faculty also made several world class achievements like KULITKU human skin engineering where scientist have succeeded in culturing human skin. “The skill of the medical research is evident when The Medical Molecular Research Institute or UMBI has been accorded as one of the Higher Learning Centres of Excellence” she said. The recognition has enabled UMBI to get RM9 million in funding for cancer research. The Faculty of Dentistry was given an allocation of RM35 million to enable the Faculty to have the resources to engage in quality research and produce skilled graduates. The Law Faculty has since its inception produced 1581 graduates some of whom are now judges and members of Parliament.